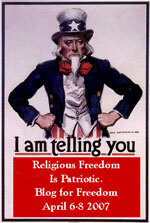 More of my favorite excerpts from the Blog against Theocracy blogswarm. The VirusHead post is here. 43) An American in Melbourne: Same post as #33 above… hmm.